The cost of driving a vehicle is six times higher than the cost of riding a bicycle – that’s the conclusion of a March 2015 meta-analysis. Coupled with the fact that most American highways are financial losers, we should be looking for alternatives to the personal automobile, especially for personal transportation. While there have been many U.S. studies focusing on the financial benefits of bicycling versus driving, many of those studies have focused on vehicle operating costs. The March 2015 meta-analysis titled “Transport transitions in Copenhagen: Comparing the cost of cars and bicycles”, by Stefan Gössling and Andy S. Choi, focused on how Copenhagen is prioritizing the bicycle as a transportation mode. The study looked at how Copenhagen is planning to boost funding for bicycle infrastructure all while making quantified goals to reduce serious injury rates and expanding their bicycle infrastructure network. In San Diego, in casual conversation with a cycling sympathetic audience, time and personal discomfort (being sweaty) is often listed as a reason for why cycling will not be able to compete with the personal automobile as a travel mode. Gössling and Choi includes those San Diego concerns and analyzed it alongside other societal costs that arise from investments made to promote driving versus bicycling. 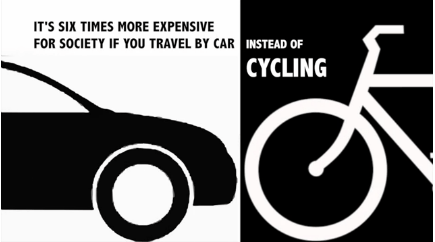 The study looked at vehicle operating costs, time cost, accident cost, cost of air pollution, climate change, noise, congestion, road deterioration, life expectancy, perceived safety, and branding and tourism and concluded that driving a vehicle cost six times more that riding a bicycle. The authors of the study do acknowledge that the Danish approach does have limitations in that some aspects of a cost benefit analysis cannot put a financial cost to discomfort or the effects of injuries or death such as post-traumatic stress disorder or depression. But the authors do state that such a cost benefit analysis “can be a useful methodology to investigate advantages and disadvantages of bicycle projects, which are essential to foster bicycle cultures, i.e., lasting and significant changes in transport cultures.” Thus this approach can be important in making an economic justification in making investments to supporting and increasing cycling. All of this is part of Denmark’s capital city to become world’s best city for cyclists’ along with becoming a “leading ‘eco-metropolis’”. With Euro 33.61 million invested to improve cycling in the city in 2013 alone, Copenhagen is well on their way to making that vision a reality. Thank you to BikeSD member Julie G. for sending in this study!